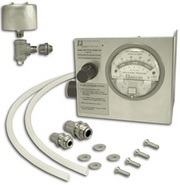 The DP transmitters are designed for low pressure measurement in HVAC applications. They are available in full scale pressure ranges from 0.25 inH2O and to as low of 0.025 inH2O full scale. Both models are available in 4-20 mA or 0 to +5 Vdc signal output options. The D/A Pressure Transducer is designed for direct application in DC strain gage instrumentation systems which require low pressure ranges not generally available in strain gage transducers. Functionally, it is a direct replacement for a strain gage transducer, providing a 5 mV/V nominal DC output over an excitation range of 5 to 12 Vdc. The High Line Pressure transducer is designed to make low differential pressure measurements at high static line pressures. Operating from unregulated 9 to 55Vdc, It is available with 4-20mA, ± 5Vdc or isolated ± 5Vdc output over full scale pressure ranges from ± 5 to ± 10,000 psid. The output shift due to static pressure will not exceed 3% of full scale, up to a line pressure of 12,500 psig. General Purpose pressure transducers provide cost effective gage pressure measurement solutions for your industrial applications. It includes a rugged design and stainless steel wetted parts and it features superior performance with 0.25% accuracy and temperature compensation. The instrument is a portable, completely self-contained digital pressure manometer, available in absolute, gauge and differential ranges. In addition to the front panel liquid crystal digital display, the unit also provides a 2 Vdc analog output suitable or recording, remote display or control purposes. This is a compact differential pressure transmitter designed for industrial pressure measurement applications. The variable reluctance sensing technology allows the transmitter to be used in a wide variety of low pressure measurements where fast dynamic response, high resistance to vibration and superior signal stability through temperature change is required. It will accept both liquids and gases directly at the sensing diaphragm; there are no internal isolation fluids to slow the sensor response or cause temperature drift errors. The Differential Pressure Transducer is the combination of a variable reluctance pressure transducer and a miniature carrier demodulator integrated into a single package to provide for operation from mobile dc power and deliver a standardized dc output suitable for recording or telemetry. The Absolute Pressure Transducer, is designed for low and medium pressure measurements, to laboratory accuracy, of corrosive liquids and gases. In typical AC excited bridge circuits, this transducer delivers a full-scale output of 40 mV per volt at 3kHz. The unit operates with carrier systems including a sine wave carrier demodulator and a miniature DC input DC output carrier demodulator to produce a high level analog DC output suitable for recording and control. The Draft Range Transmitter is designed exclusively for very low pressure measurement needs. It has a “true” full-scale range as low as ±0.25” H2O, making it ideal for air flow control applications. It can be turned down to ±0.1” H2O; higher full-scale ranges to ±100” H2O are available. The transmitter offers 0.5% accuracy and an operating temperature range of -20°F to +185°F. The total combined temperature effects are less than 3%/100°F. The Pressure Transducer, is designed for low and medium pressure measurements, to laboratory accuracy, of corrosive liquids and gases. In typical AC excited bridge circuits, this transducer delivers a fullscale output of 30 mV per volt at 3kHz. The unit operates with carrier system including the sine wave carrier demodulator and ther miniature DC input DC output carrier demodulator. The digitally compensated differential pressure transmitter designed for industrial pressure measurement applications. The on-board microprocessor provides high accuracy and improved stability in changing thermal environments. It is designed for a wide variety of low pressure measurements where fast dynamic response, high resistance to vibration and superior signal stability through temperature change is required. The transmitter will accept both liquids and gases directly at the sensing diaphragm.